Before Jake was born, several of my well-meaning friends told me to say goodbye to homemade cookies and from-scratch dinners. Wish my kitchen well and move on. I both scoffed and worried about that advice. Was it really true that I wouldn’t be able to spend time cooking and baking the way I really like to? While it’s certainly true that having a kid turned my world upside-down, I have discovered that we can do almost anything together if I am patient. Including baking! This Christmas season, during a time when family and togetherness are at the forefront of everyone’s minds, I thought I would share with you a few tips that may encourage you to spend time in the kitchen with even your littlest ones. 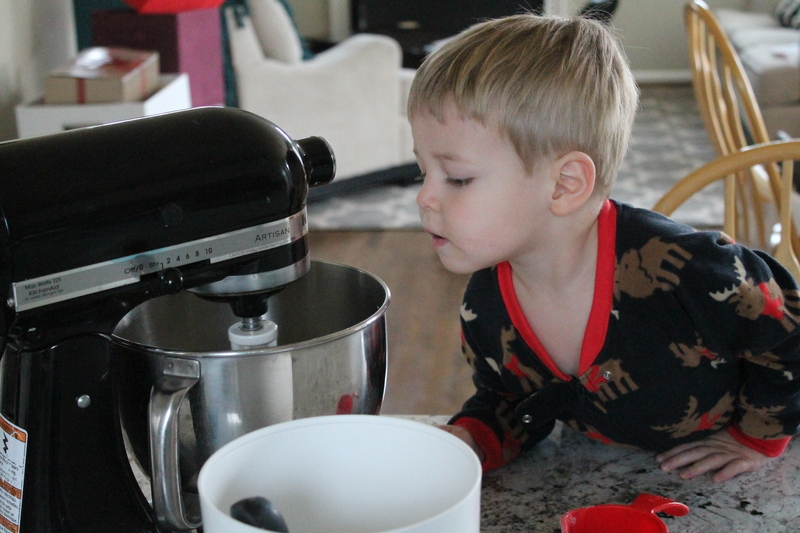 Jake and I have been baking together since he was old enough to stand on his own—he can’t wait to help or watch with even the most mundane kitchen tasks, like making coffee! And it is my sincere hope that he will grow into a confident chef as we continue to cook together! I start off by loosening my own expectations about how the dish will turn out. Toddlers make a mess! They occasionally grab and lick things you don’t want them to lick or grab. It’s inevitable. Everything will take at least twice as long if you let your toddler “help” you. The cookies might not be evenly sized or shaped when they go into the oven. As long as I am okay with that, then baking with Jake can be a lot of fun! 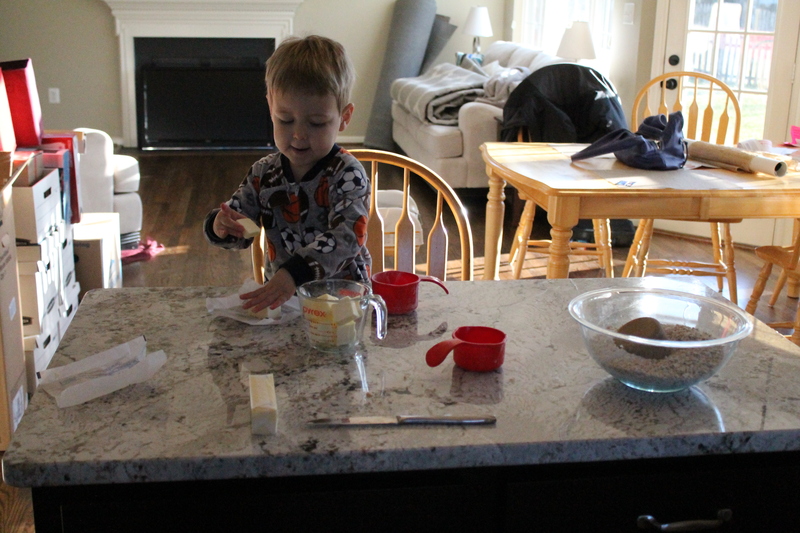 When I set out to bake something with Jake, the first thing I do is make sure all the counters are clean. I mean, no need to sanitize them or anything, but I can guarantee that at least a tablespoon of flour will end up on the counter, along with a generous smattering of sugar granules and probably some smears of butter. Depending on how much gets spilled, I often find myself sweeping the ingredients off the counter and depositing them into my mixing bowl. So it definitely helps to know that the counters started out clean, and anything on the countertop probably belongs in the bowl! Of course, it’s also imperative to make sure that everything within reach of the chair or stool your toddler will be standing on is safe. No knives. No fragile breakables (unless you are confident that your child is past throwing things on the floor unexpectedly). I also recommend reviewing your recipe ahead of time. 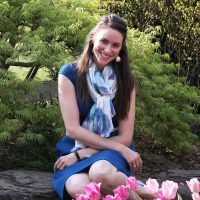 It helps to be mentally prepared for each of the steps and to set out ingredients that normally would be far away (especially if your toddler is unpredictable when left to his or her own devices). But the MOST IMPORTANT thing to do ahead of time is just decide to have fun! Baking is fun, and baking with Jake is fun! I know you will have fun with your toddler in the kitchen, too. 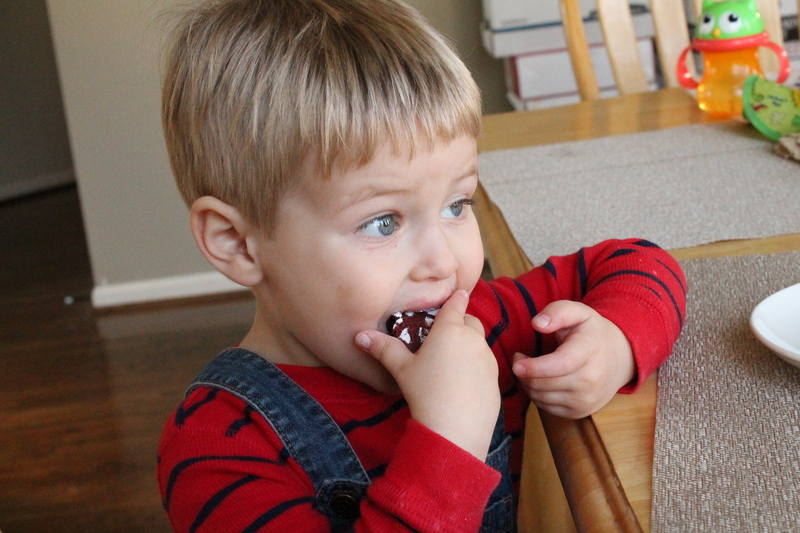 Just as we adults follow rules in cooking, be they as obvious as “keep your fingers away from the knife blade” or as routine as measuring our ingredients, toddlers need rules to help them succeed in the kitchen. Toddlers and older children thrive on rules and established expectations! I learned from experience that my curious kid would swipe the butter from the beaters and stick the spoon in his mouth every time. Now, I remind him about our two rules every single time before we get started. As soon as he stands up on the chair, I remind him that he must not put his fingers in the bowl, and he needs to leave the ingredients alone. It really helps! 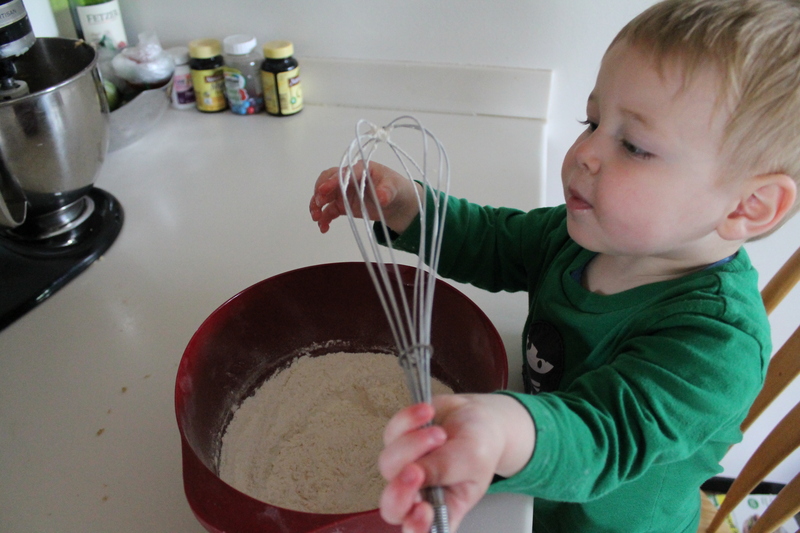 We come up with a few other rules as we go, mostly things like, don’t touch the whisk while Mommy goes to get the next ingredient. The flip side of this is that you must decide what the consequence will be if your kid breaks a rule. At our house, if Jake licks something he is not supposed to, or directly disobeys something I just said, I immediately back the chair away from the counter so he cannot touch anything. (He used to have to get down, but in our new house we have some extra space for backing away.) He is able to earn back the privilege of helping after a few minutes if he waits patiently. However, if he throws a fit (as he often does), then he does not get to come back and help. I warn Jake ahead of time, while we are reviewing the rules, that he will have to get down or move back if he breaks a rule. And then I always follow through with the consequence. I think that’s the only way to grow toward a truly fun experience of baking together! Toddlers love to dump! Dumping was Jake’s first task in the kitchen. When he was about 15 months old, he would immediately start begging to dump the ingredients as soon as I pulled out my bowls and whisks. 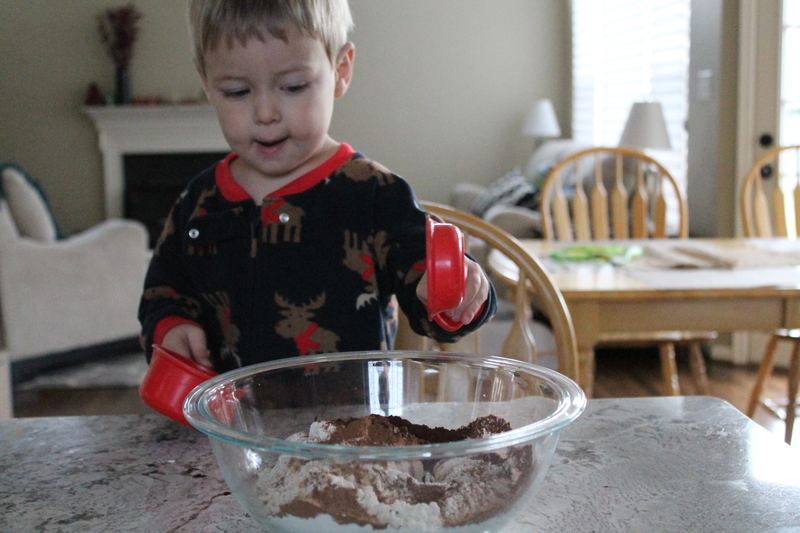 Even a really young one can enjoy turning the ingredients out of the measuring cup—though Jake was (and still is) exuberant in his wrist motions, sometimes resulting in flour on the counter. We started with brown sugar, which is packed together and less likely to make a huge mess, and we worked our way up through flour, milk, and even eggs. I do hang on to the handles sometimes to help him get everything into the bowl. 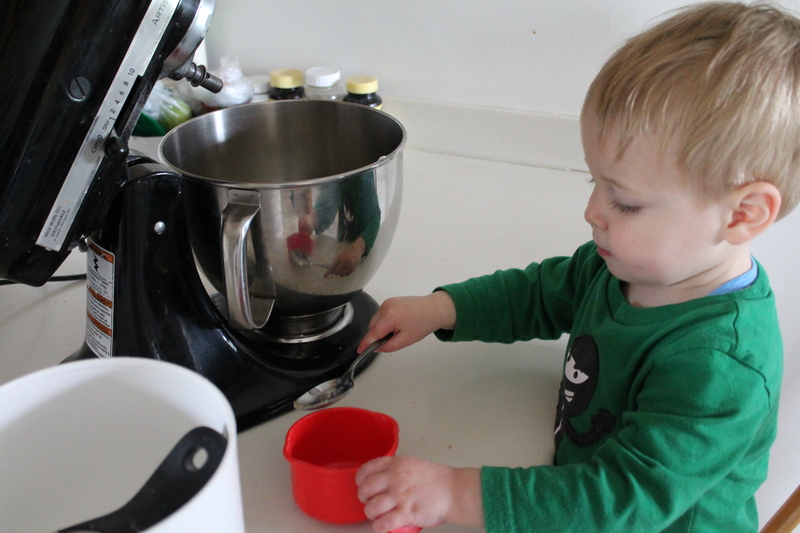 Toddlers also love to stir. Right now, Jake mostly gets to whisk the dry ingredients. He also loves to hang on to the hand mixer with me if we are whipping something by hand! But, best of all, we have graduated to rolling. These crinkle cookies that I am about to share with you have some striking parallels to play-doh! The dough gets rolled into balls (Jake’s favorite) and then rolled in two kinds of sugar! 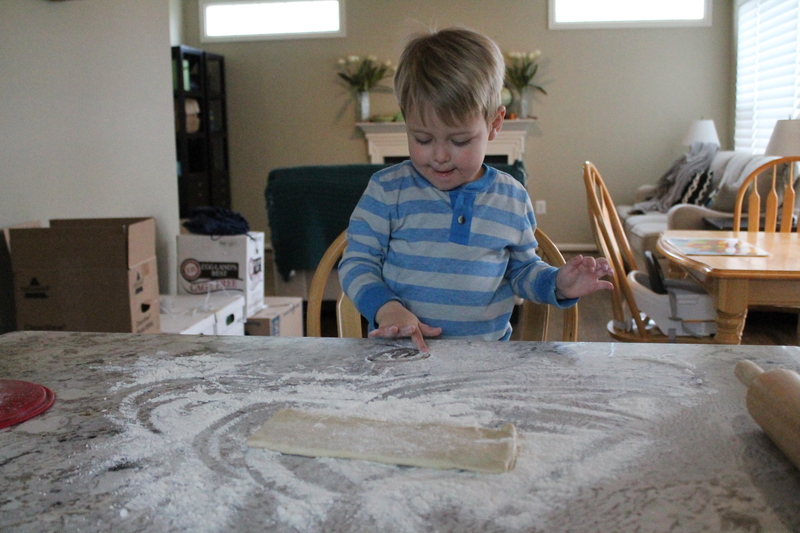 Jake just loved being able to roll the cookie dough. He loved it when I oiled his hands. Which brings me to a really important suggestion: pick recipes to do with your toddlers that will really delight them! I may not love rolling and decorating sugar cookies, but Jake thought it was the best thing since sliced bread (and believe me…he looooooves bread). I may want to move quickly, but this is a fun experience we are having together! If I teach him to love being in the kitchen and love the results now, hopefully he will want to help me in the future with necessary evils like dinner! Of course, toddlers learn a lot when you talk to them! Not only are they learning language, but they are stuffing tons of information into their heads! 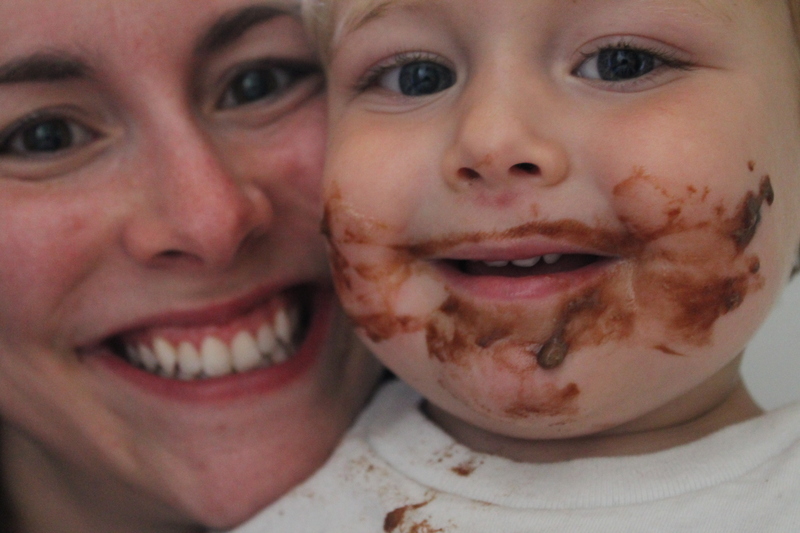 Talking to toddlers, and asking questions, and listening when they talk back…it’s kind of what motherhood is, right? Let’s just extend that to baking! 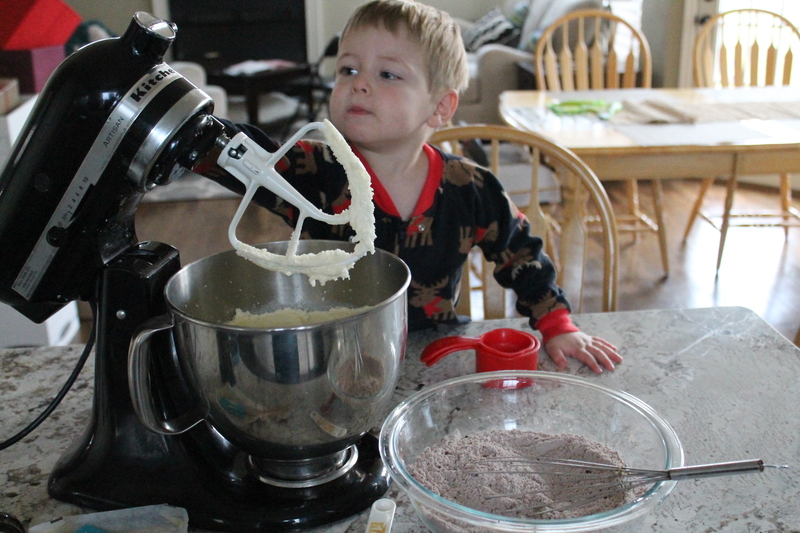 You don’t have to know everything about baking to talk to your toddler about it; it’s also okay to admit that you are still learning! That shows them that learning is a lifelong process, and also that their parents, while awesome, aren’t omniscient. True story. So let’s bake some cookies! 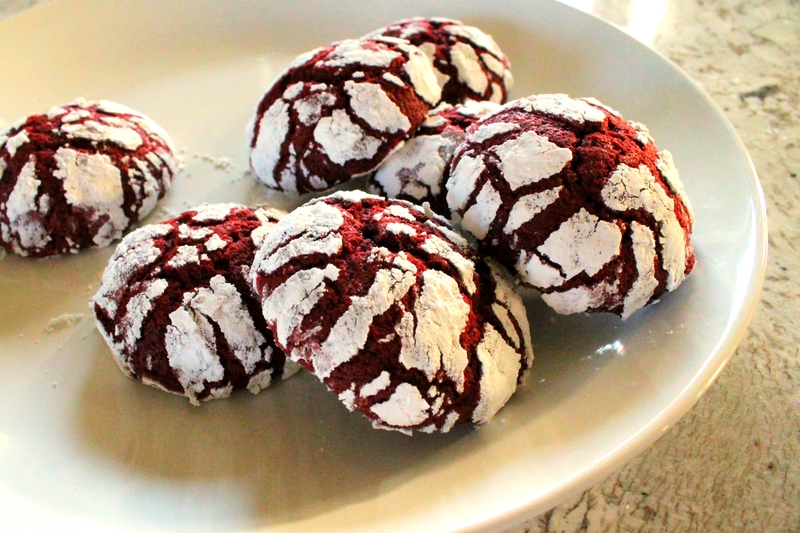 Jake and I made these red velvet crinkles together twice (once even to give away as part of a cookie exchange!). 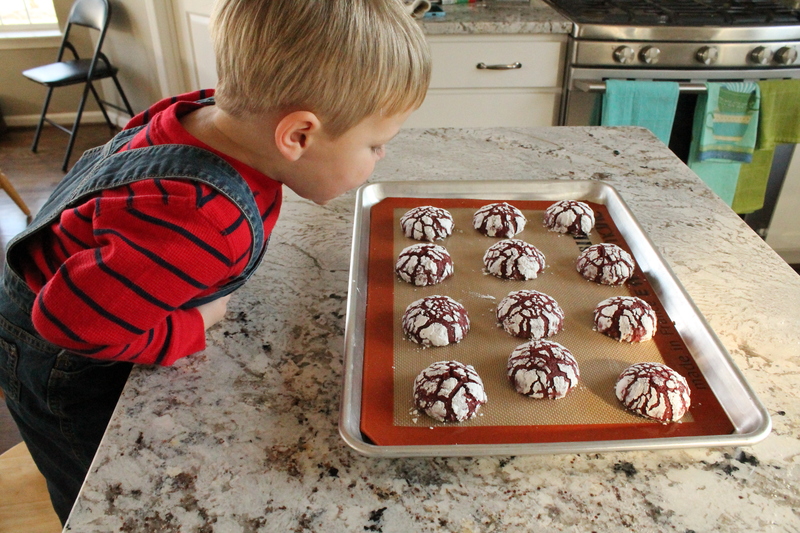 He loved it both times—and he remembered important lessons from the first baking experience, like “I will not get to stand at the counter if I try to put a cookie dough ball in my mouth.” Hey, I’m just keeping it real. But the point is, as I was reminding him about the rules for our second batch of cookies, he told me that one of the rules was not to eat the cookie balls! Hooray! 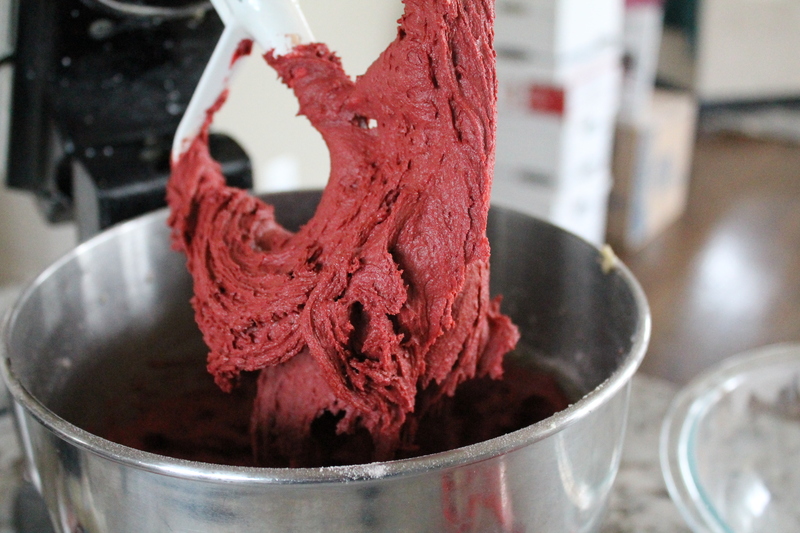 Then, whisk until the flour mixture is evenly cocoa-colored. Your toddler will love helping with these steps! 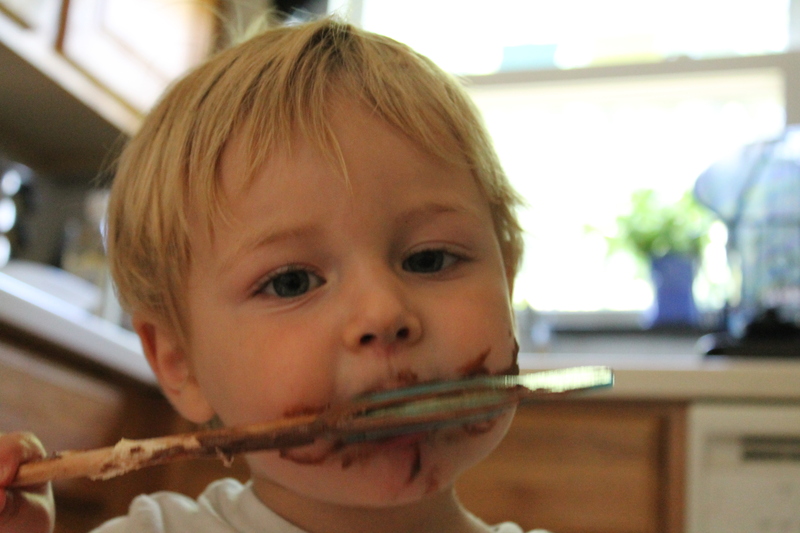 Now set the flour mixture aside…preferably on a far counter if you are baking with a toddler. Don’t go asking for trouble. Add the eggs in to the butter in the mixing bowl. I let Jake help with this sometimes: I break an egg into a measuring cup, then he pours the egg into the bowl. We count the eggs together, and sometimes he even gets to select the eggs out of the carton for me. It’s pretty cute to watch him trying to figure out how to pull the two halves of the egg apart even though he hasn’t cracked it open! Make sure you scrape the bowl in between each egg addition. Eggs are liquidy and the butter is still relatively firm, so if you don’t want chunky cookie dough, scraping is your friend. Now add the liquids. 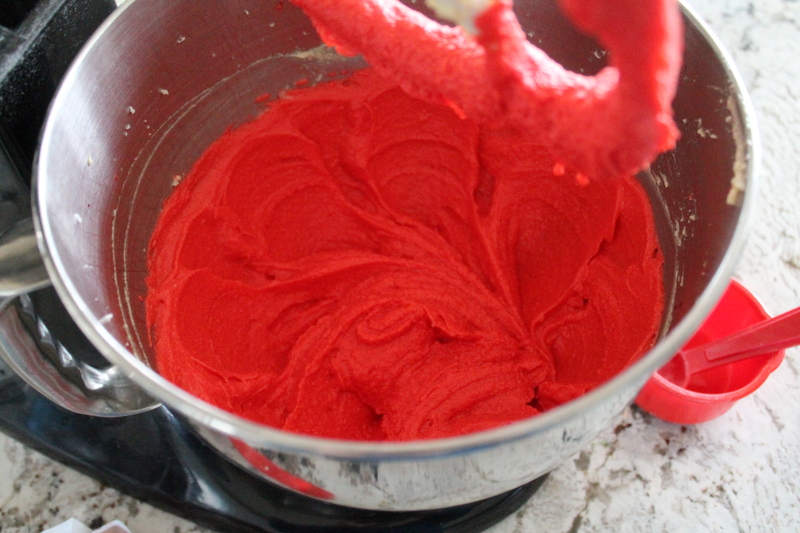 Again, great toddler step—except for the red food coloring! No, I definitely don’t want my kiddo accidentally dyeing the kitchen or himself bright red, so he does not get to handle food coloring. He still thinks food coloring is pretty cool. Now it’s time to mix in the flour. This is an observing step for Jake, as even I tend to get flour on the counter when I am pouring it from one bowl into another. He watches while Mommy makes a mess and then cleans it up! That’s good learning, too, right? When the flour is all mixed in and you have scraped the sides of the bowl, it will be time to chill the dough. This used to be a very emotional step for Jake. He would get quite upset that all his hard work was disappearing into the fridge before he got a chance to eat it. But now, he minds less and less. Just look for a distraction. We actually made our cookie dough before nap time, that way he could wake up and immediately get back to making some cookies! With lightly oiled hands, roll the mounds into shiny red balls. This is a GREAT thing to let your toddler help with! Yes, his hands will be oily and slightly red (all the better to play in the soapy sink later, right? ), but it will delight him to have the dough in his hands! 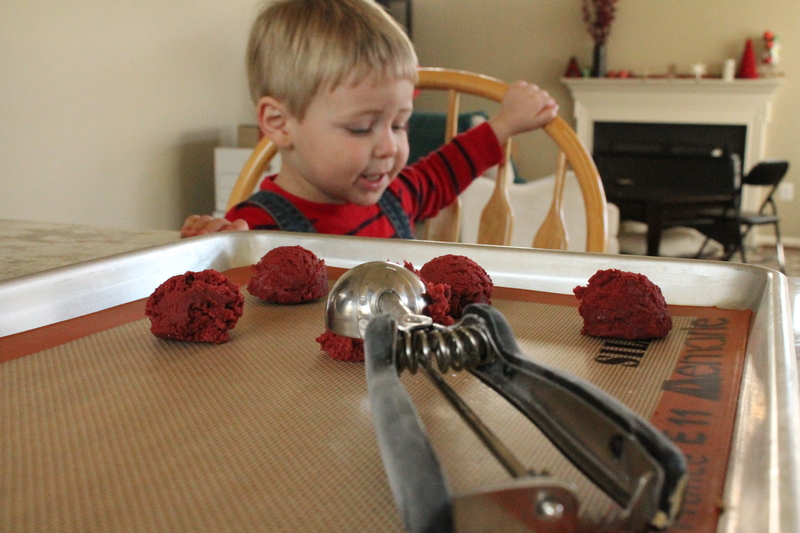 Jake did well with not squishing or trying to eat the dough, but if your toddler wouldn’t do so well with that, then keep him or her on a short leash! I did have to re-roll most of the “balls” that Jake worked on, and I kept having to move them away from each other on the pan, but he thought it was delightful that we were treating cookie dough like play-doh. Now roll the dough balls in two sugars. Jake’s job was to pick up the balls and deposit them in the sugar bowls—yes, he sometimes tried to toss them in or drop them from towering heights, and sugar got on the counter. But he was generally successful! The granulated sugar helps to give the exterior of the cookies a little crispness, while the powdered sugar obviously gives them their lovely crinkle effect. In a medium bowl, whisk together the flour, cocoa powder, baking powder, baking soda, and salt until uniform. Set aside. In a mixer bowl, beat the butter and 1⅓ cups sugar until well combined. Add the eggs, one at a time, scraping the sides of the bowl between each addition. Stir in the milk, vanilla, vinegar, and food coloring. Add the flour mixture to the bowl in two batches, stirring until just combined. Cover the bowl with plastic wrap and chill in the refrigerator for 2 hours. When ready to bake, heat the oven to 350°. Line two baking sheets with parchment or silicon mats. Scoop the dough out in heaping tablespoons. With lightly oiled or buttered hands, roll the dough into balls. 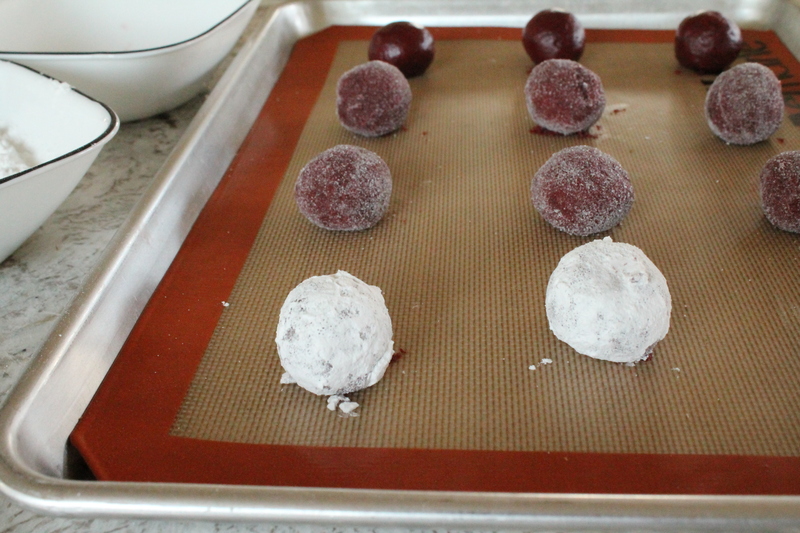 Roll the balls first in the extra granulated sugar and then in the confectioner’s sugar, covering completely. 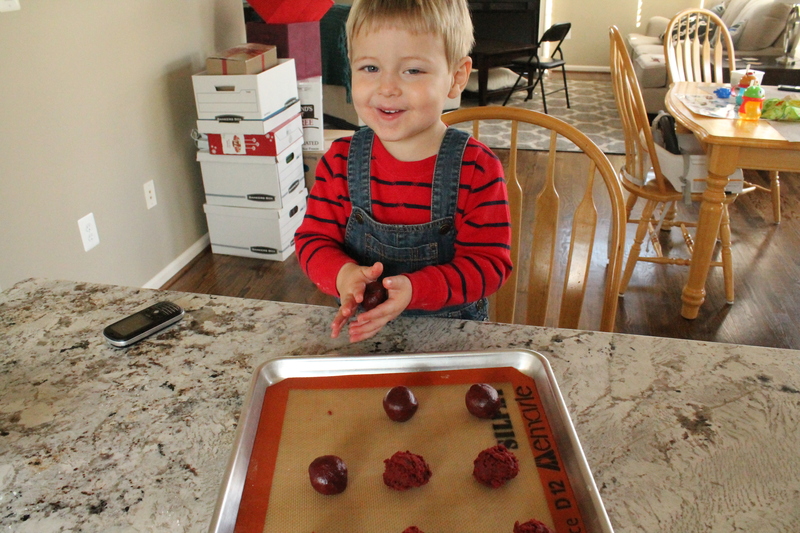 Set the balls 2ʺ apart on the prepared cookie sheets. Bake 13–14 minutes, until puffed and barely set. Cool completely on a wire rack. Wow, baking/cooking with a toddler sounds like a scary task! Who knew it would be worth it, both as entertainment and as education! Is not really scary!! It’s fun! And Jake loves it! Jake is very cute and so lucky to have a mama like you! I love this! Such great advice and really cute pictures! I don’t have kids (yet? ), but my friend said the same thing about not being able to cook from scratch, and it really bugged me too. If we do have one, I really like your tips!!!!!!!!!!!! I would definitely try to push myself to accept the mess/challenge/speed because the end result of having a child who knows how to cook if they want to (and possibly even loves it!! whoo hoot!) would be so worth the short-term challenges. There are many people who love to cook whose kids can’t at all, and obviously they shoo’d them out of the kitchen 🙁 Makes sense, but I love your intentionality about it. Great rules/guidelines/suggestions! Thanks! Whenever you do have kids, I hope they have a blast cooking with you!